We’re hearing a lot about voice search lately, and that trend doesn’t seem likely to disappear. But does it have a direct impact on how you should be thinking about your SEO strategy? In today’s Whiteboard Friday, Rand discusses what to expect when it comes to the future of search and what you can do to stay on top. Howdy, Moz fans, and welcome to another edition of Whiteboard Friday. This week we’re going to chat about voice search, conversational search, Internet of things search, and how these attributes and the rise in these trends may or may not play a big role in our SEO strategy and tactics for the future. Today, we have a few sort of nascent beginnings of this, and I made a prediction at the beginning of this year, in my traditional predictions post, that voice search, conversational search, Internet of things, that these wouldn’t actually have a big impact or much of an impact at all on the web marketing world. What we are hearing is from the engines, specifically Google and Bing, talking about how a higher and higher percent of their queries are coming through voice searches. However, what we’re not hearing is how this might be changing SEO or whether it’s changing SEO. So today what we have going on is things like folks asking their device, their Android device, “Okay, Google, what’s the difference between libel and slander?” You might hear this. Maybe you have a question, something you want answered, and Google will respond verbally to you, or they might just show you the results on the screen, and then you can click through to there, or some combination of the two. You can ask your Alexa device, the Amazon Echo Alexa device, you can ask it, “Alexa, did Iceland beat England in the Euro soccer game,” or football game as English and Icelandic people would call it. In fact they did. 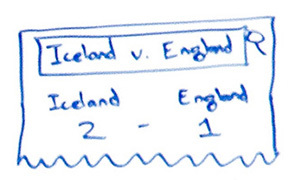 Really, sorry about that England, but I kind of want to see the Icelandic commentator freak out again. That seems exciting. For Apple products, “Hey Siri, where can I get Vietnamese rice noodles near here?” And Siri will look around you, and then return some results, that sort of thing. Of course, there’s also this idea that with more and more cars are becoming hotspots for searches as drivers ask their cars things or ask their phones in their cars things like, “All right Tesla,” this is not real, you can’t actually say this to Tesla yet, but I’m sure it’s coming, “When is my brother-in-law’s birthday, and does he drink whiskey?” Hopefully, your Tesla will be smart enough, through whatever partnerships it has with these other technology companies, to be able to answer that. This is what’s happening today. We’re seeing the rise in conversational and voice search. So there’s a new and different kind of keyword demand and also a new and different kind of result set that returns because of that. Does it really make a huge difference from an SEO perspective? Well, I’m going to argue that not yet, no, it doesn’t. However, I think there are strategic and tactical things that we should be paying attention to as this world progresses, this world of voice search, conversational search progresses. We’re going to see a continual rise in instant answers. What is happening is that when a lot of these voice and conversational search queries are coming through, they tend to be longer, and they tend to be seeking out an answer that a device can quickly give you a direct answer to. Things like, what I placed here, and this requires some logic and some understanding from the machines, some contextual understanding, but it’s not that challenging, and the machines are doing a good job of this. I suspect that what we’ll continue to see is that the percent of queries with an instant answer result keeps rising over time. Now this is percent, not absolute numbers. I mean, obviously the absolute number is rising, but that doesn’t necessarily mean that the traditional kinds of queries that have been made to search engines are going to disappear. In fact, one of the things that I would urge you and caution against is to say, “Oh, because voice and conversational search are rising, we should stop paying attention to direct, traditional web search and web results.” It may in fact be the case that even with the rise of all these instant answers and new SERP features and voice search that the raw number of clicks on search results in your industry, in your field, for your keywords may actually have gone up despite all these trends. Because these trends are additive, they are not necessarily taking away from other forms of queries, at least not necessarily. The way I’d phrase this is if a certain percent, X percent of queries that result in traffic can be answered in fewer than Y words, or with a quick image or a quick graphic, a quick number, then the engine is going to do it themselves. They don’t need you, and very frankly they’re faster than you are. They can answer that more quickly, more directly than you can. So I think it pays to consider: Are you in the safe or dangerous portion of this strategic framework with the current content that you publish and with the content plans that you have out in the future? So if you’re in the world of food and cooking, recipes probably very safe. It’s very, very difficult for an engine to say, “Okay, here let me read you the ingredients. Let me show you the photos. Let me give you the entire rundown. I’ll give you the comments. I’ll give you the star rating.” This is too complex. What’s very simple is cooking conversions. “Alexa, how many pounds of flour do I need to make up a cup?” Very simple cooking conversion, instant answer very possible. Pretty dangerous to be relying on a ton of your click-through traffic for that dangerous stuff. Sports analysis, very, very difficult for any of these services to try and provide analysis of a game, very easy for them to provide a score. Learn to code tutorials, almost impossible to disintermediate, but a quick function look-up, very easy to disintermediate. SAFE: If it’s hard to aggregate and present simply, you have a competitive advantage, and you probably will be able to keep that traffic. 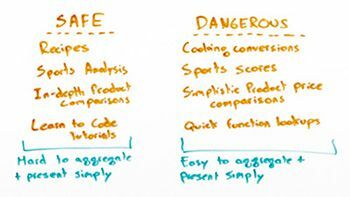 DANGEROUS: If it is easy to aggregate and present simply, you’re probably in dangerous territory long term. It requires SERP analysis of both desktop and mobile, and preferably in the future I think we’re actually going to be looking for keyword research tools that can perform a voice query and then can tell us what the results either look like or sound like from the engine. We need to do our prioritization of keyword targeting, which keywords we actually want to select and which keywords we want to create content for and try to rank for, based on our click-through opportunity and our value. If we don’t have that information and that data, then we’re probably going to be choosing some keywords unwisely compared to our competition who is thinking about this. If someone searches for libel versus slander, it is the case that if you rank on the first page and you have the right content structure, Google may pull you into that instant answer box. What we’ve seen from our research is that being in that instant answer box is not a bad thing. In fact, it tends to increase click-through rate and overall traffic for many, many publishers. Not true for everyone. Some instant answers do really disintermediate queries, the “Iceland versus England, what was the score?” If Google just tells you, you don’t need to click through. 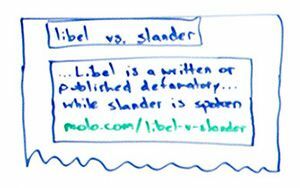 But certainly on libel versus slander you may see libel is written or published defamatory statement, while slander is spoken. It’s very likely that people will actually be clicking through to learn more about that subject, and then you have an opportunity to serve up ads or to serve up your services or whatever product you’re selling, those types of things. So format things intelligently. Dr. Pete did a great blog post* on how to rank number zero, how to get into those instant answer results. He recently did a presentation at SMX Advanced that he’s published on SlideShare, that you can check out as well. Both those resources very handy. So if keyword search volume for the terms and phrases that you care about, if the orange is typed and the green here is voice search, you can see that it looks like over here this is 60% plus, so voice search has overtaken typed search. But what’s actually happened is that, year to year, typed search has gone up as well. It didn’t stop paying to try and rank for these keywords. In fact, it paid more and more dividends. It’s just that voice search grew even faster. So I think we have to be cautious if we think about voice as completely disintermediating or taking over our industry or our content. Rather we should think of this as additive, and we need to pay close attention to the true overall volume demand, both typed and voice search over time. 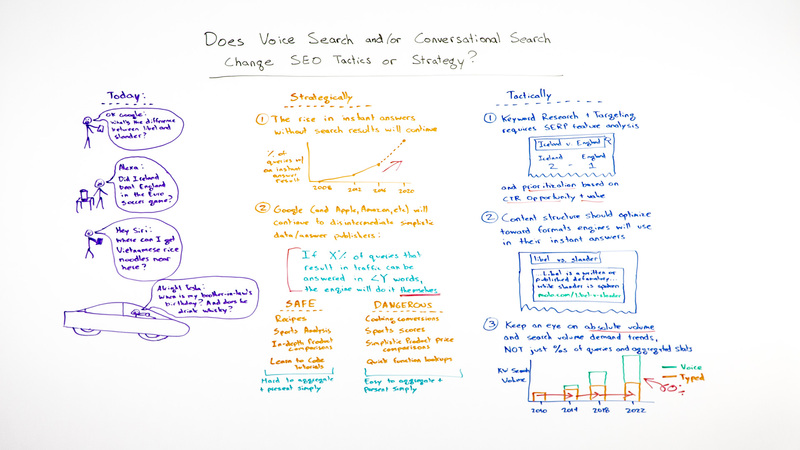 All right gang, look forward to your tactics, your strategies for voice and conversational search, and we’ll see you again next week for another edition of Whiteboard Friday. Take care.